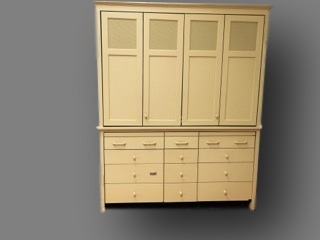 Our innovative Mini-Kitchen Armoires conceal complete compact kitchens within exquisite pieces of furniture that can be styled to blend with the décor of any room. Many sizes and models are available. 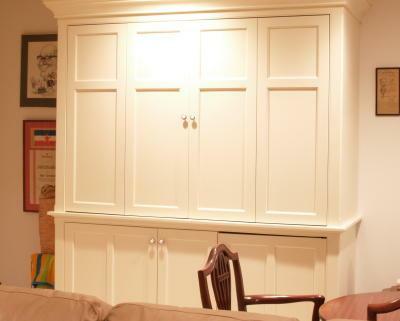 They can be unfitted, freestanding pieces or they can be built-in. They are the perfect solution for any upscale multi-task room that needs to conceal a messy kitchen. They can save space too as there is no need to build a separate room to hide a typical kitchen. And saving space is the most GREEN strategy of all! They are ideal luxury efficiency kitchenette units for Studio apartment kitchens, Condominium Owner’s suite, In-law suites, Guest suites, Extended stay hotel suites,Home offices, Executive office, Break rooms, Home theaters, Pool houses and so many more. The key engineering feature that differentiates YesterTec Mini-kitchens from ALL others is their ability to safely conceal the built-in cooking appliances (the oven and cooktop). Both of these appliances will not operate with the bi-fold doors closed in front of them. When the doors are opened and placed back into their pockets, the power to the appliances is activated. YesterTec is the only company in the WORLD that offers this U.L. Listed safety technology. And Only 120V power is required to operate any model! Residential Mini-Kitchen Applications: Studio Apartment, Guest Suite, In-Law Suite, Master Bedroom Suite, Home office, Sun Room, Game Room, Home Theater, Pool house. Have Questions? Just pick up your phone and call David Beer, YesterTec’s President at 877-346-4976. 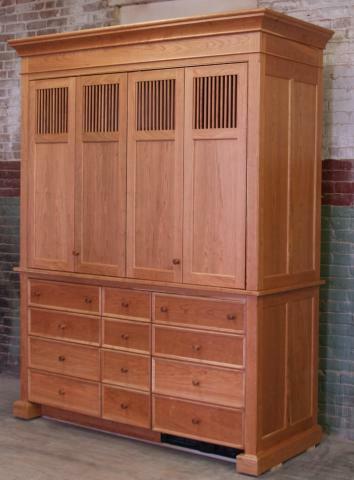 This Natural Maple unfitted UK68B-CSR-MH Armoire features an 18ga. stainless steel sink, 120V two burner glass cooktop, and a standard microwave/hood. However GE’s 120V Advantium over-the-range speed cooking , microwave oven/exhaust hood is recommended because it is a real oven that can cook or bake anything. Also shown is a single dish drawer dishwasher, a 5+ cu. ft. refrigerator/freezer and ample concealed solid surface countertop space. It’s dimensions are 71″W x 26″ D x84″ (Starting Height). Other appliance choices are available. 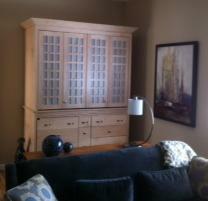 It was create for a KBIS exhibit in 2004, but now resides in a private home’s guest suite. 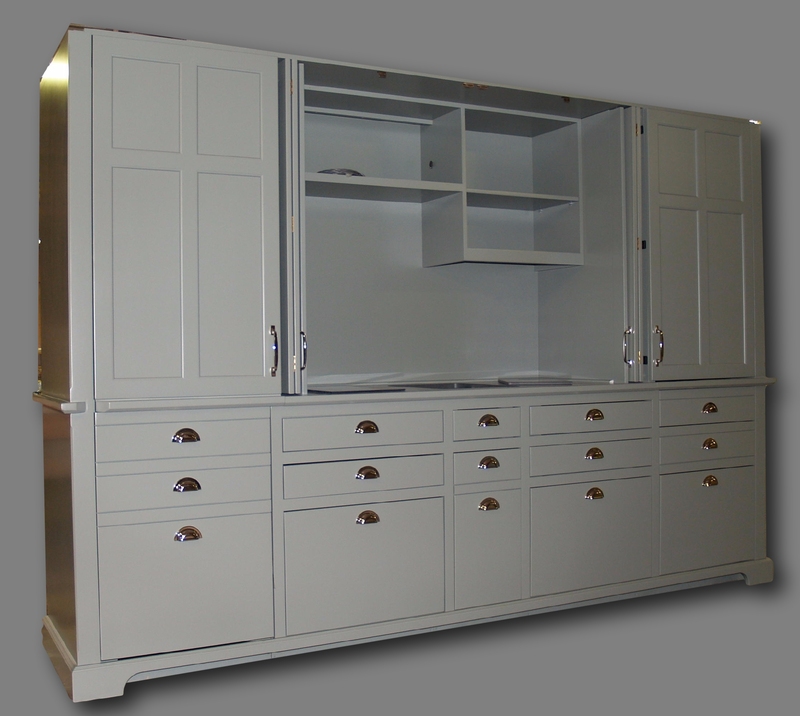 If you like this model, don’t miss our most popular cost saving Limited Edition UK64LE Armoire Kitchens. These Mini-kitchens are a simplified version of the UK68B models shown above. Should you need more storage, refrigeration or prep space, you can also add a separate piece of Kitchen Workstation Furniture to do the job. Let the Mini-kitchen handle most of the technical tasks and add an island or cupboard if you need more kitchen. That is the beauty of using separate pieces for kitchens, and the resulting ensemble still can flawlessly blend into a multi-task room. Or you can opt for our wider Master Kitchen models that have additional storage and refrigerator capacity attached directly to our core mini-kitchen models. 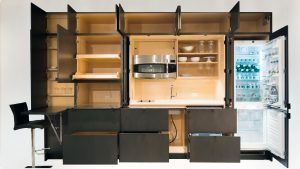 Another alternative for larger mini-kitchens is our Stealth Kitchen Module line (see below) that allows several modules to be combined to form completely concealed kitchens. The Cost? If you would like to receive a complete list of all of our models (including the size and what each can contain) as well as their starting and average prices, please contact us. Once you have reviewed that list and know which model you want, we can send the styling information to you and we can give you exact prices over the phone, as all of the standard options are in our computer’s pricing database. 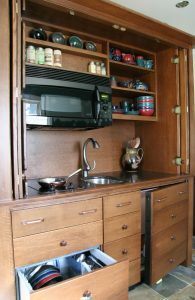 And be assured, NO OTHER COMPANY can produce comparable mini-kitchens for less than YesterTec. Most of the models are shipped in two separate but completely finished pieces, typically separated at the countertop. Appliances and sink are included but shipped separately with the order. Typically, a handy man or contractor who is familiar with kitchen installations is needed to install the mini-kitchen. So that your contractor can prepare for its arrival, we will send the rough-in electrical and plumbing drawings and installation instructions that correspond to your model. 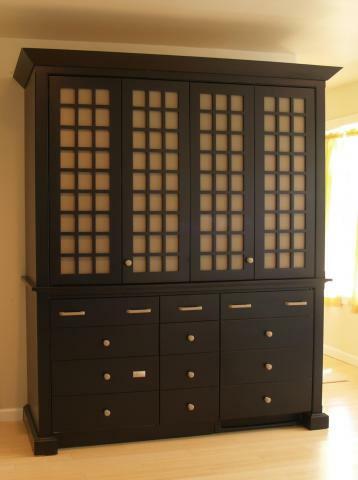 This award winning unfitted Midnight Black Armoire Kitchen is the perfect auxiliary kitchen for an upper level family room. 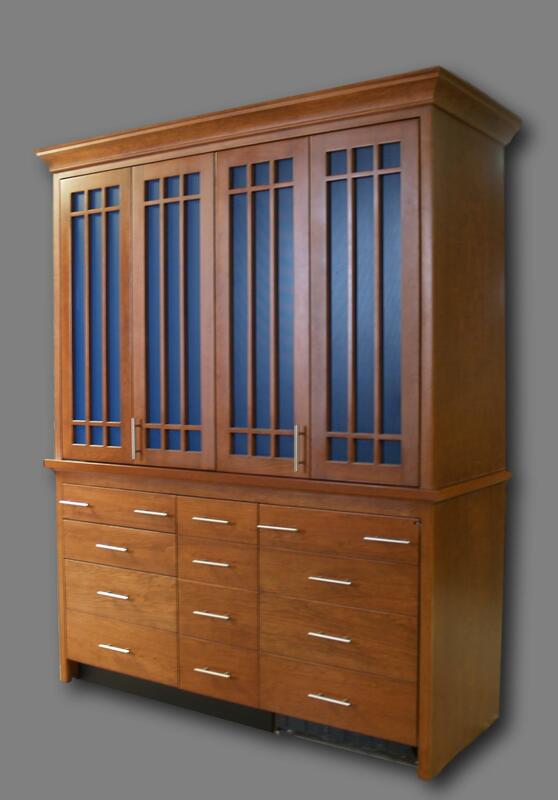 Its Nautical Grid style doors have Taupe perforated aluminum vents to allow residual moisture and heat to escape. The Beveled Cornice adds to its contemporary lines. Check out this article that Hi-Macs, the solid surface countertop manufacturer featured on their website about this mini-kitchen. The owners chose this model for their second floor entertainment room, since the primary kitchen was on the first floor. This UK66-LE is the latest addition to our new showroom. 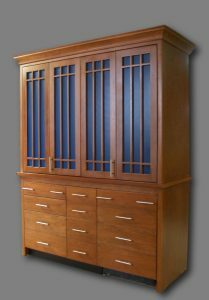 Its only custom features (in addition to our standard UK66-LE choices) are the pattern of the grid style doors and the Asian design of the cornice. The custom features were added to show you how versatile the styling of our workstations, (any workstation) can be. 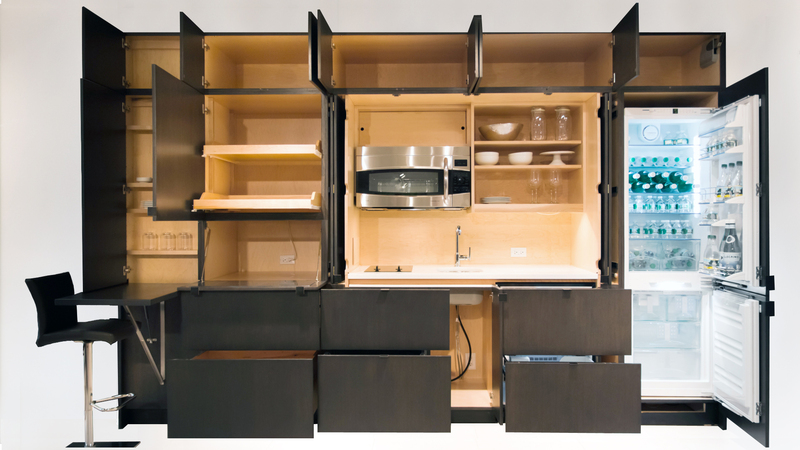 This efficiency mini-kitchen is perfect for any Studio apartment, Loft or in-law-apartment. 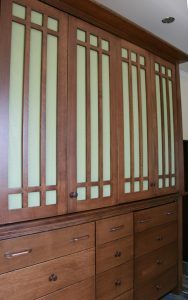 This antique white unfitted Armoire with Flat Panel doors was installed in an In-Law suite that was filled with very traditional furniture. Here is a freestanding UK68B-CSR-MH painted Faded Green. 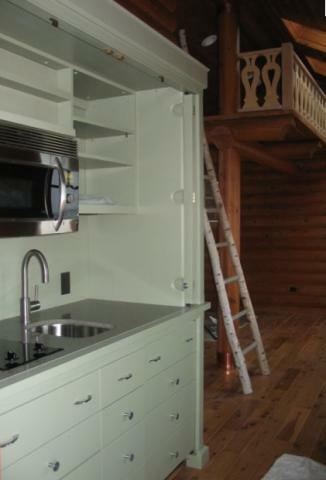 The pulls and knobs were provided by the owner of this contemporary Log Home. The Platinum Gray Hi-Macs (solid surface) counter top compliments the stainless steel door pulls, sink fittings and the black and stainless steel appliances. 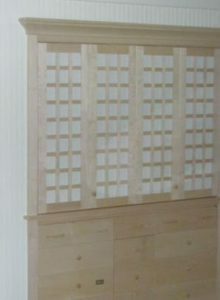 Here a natural maple Armoire Kitchen has been built into a wall in an Extended Stay Guest Suite at a tropical beach hotel. The Grid door design features Antique White perforated aluminum panels. 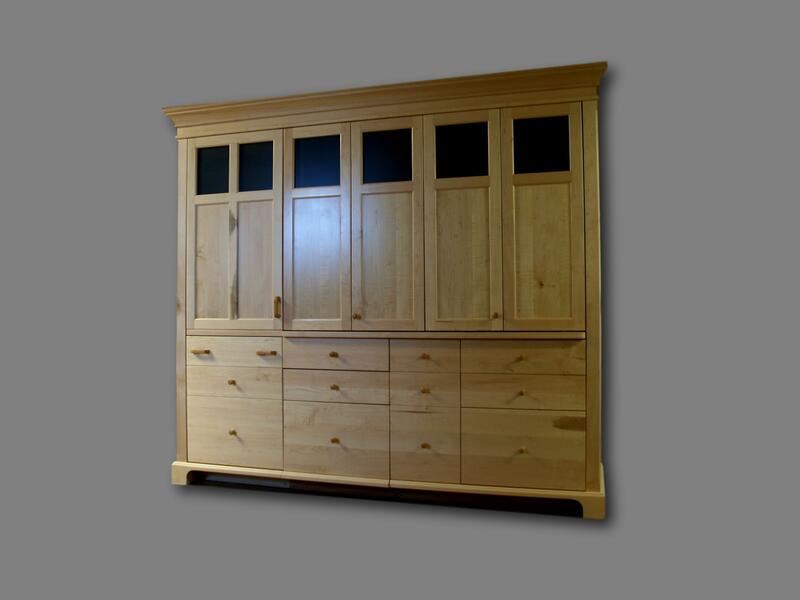 This unfitted Craftsman Oak UK68B-CSR-MH features a custom cornice and custom metal panel color. This freestanding natural cherry Armoire is temporarily set up in our factory and features flat panel sides with dowel vent flat panel doors, recessed panel drawer fronts and an extended height cornice. The owner ordered in for a Guest Suite. 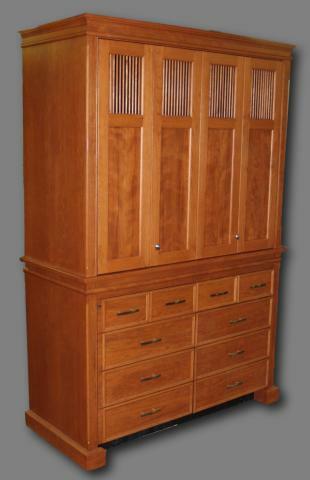 This all-in one natural maple UK66-LE-CSR-MH Limited Edition Armoire features grid doors and a bevel cornice. For Studio apartment living, this elegant piece really outperforms! This Washington Cherry UK66-LE mini-kitchen features Custom Grid doors styled in a Mission pattern with dark blue painted panels. The modern bar style pulls add a crisp look to this stylish piece. 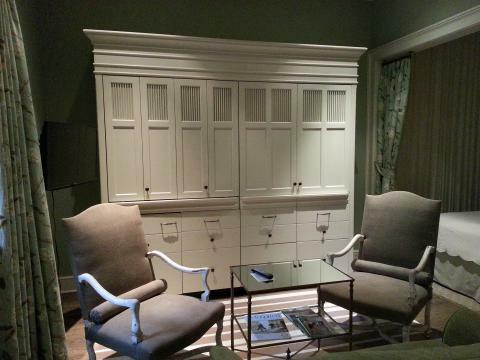 For a Boutique Hotel in the French Quarter of New Orleans, a large armoire was created that combined a UK48-CSR-MH Mini-kitchen and a clothes closet. The armoire frees the room from out of character modern appliances, countertop clutter and provides a beautiful focal point as well. Isn’t this better than the kitchens you see in typical extended stay hotel rooms? This Natural Maple SZ96-CSR-MH Master Kitchen includes a 9.2 CF full height Liebherr refrigerator/freezer/icemaker on the left side of a 66″ wide mini-kitchen. 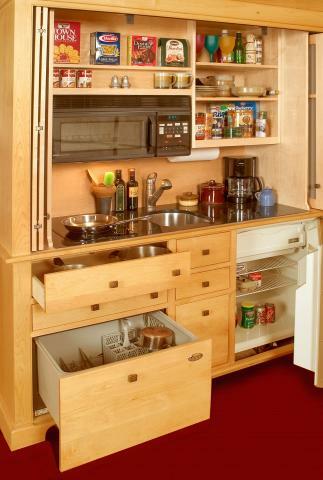 The 3 lower drawers to the right take the place of the normal undercounter refrigerator and add a lot of storage. This UK54-CSR-MH complete Washington Cherry mini-kitchen has all the appliances that our larger mini-kitchens have, but can fit into a 57″ wide space. It was designed for a guest apartment with very limited space. This Ochre painted UK66-LE has already experienced two owners! 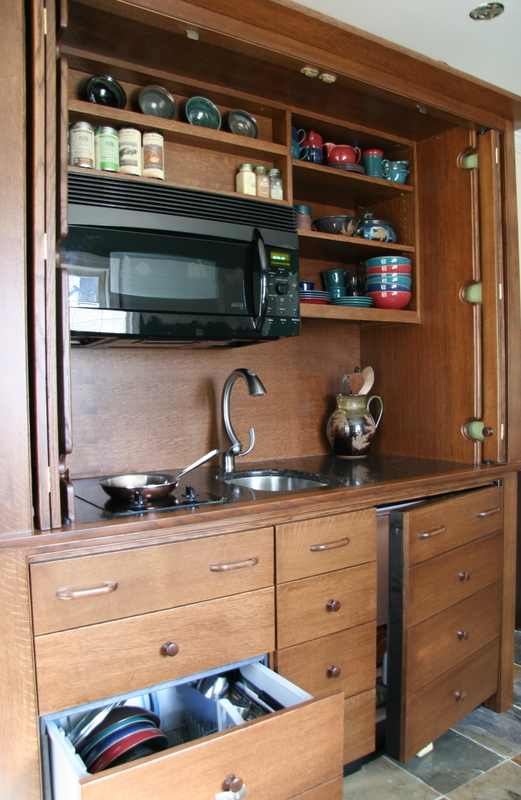 When its original owner moved, they no longer needed the mini-kitchen. We listed it for sale on our website and it was instantly snatched up by its new owner. 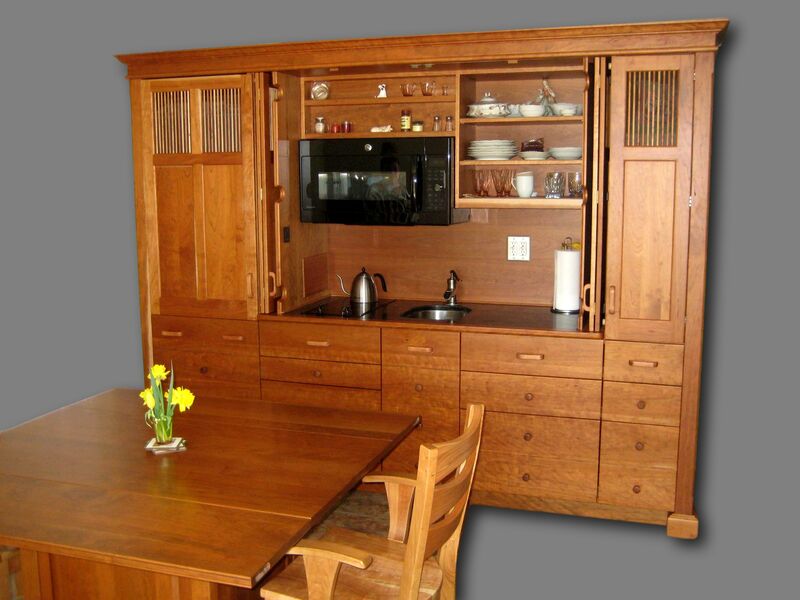 This unfitted Colonial Pine Master Kitchen (as shown above) features a 9.2 CF Liebherr refrigerator and more storage. More storage options are available as well. Dove Tailed Drawers have under mounted full extension smooth closing slides. The Master Kitchen shown above in natural cherry has a Liebherr 9.2 CF refrigerator on the the left, a UK68B mini-kitchen in the middle and a custom sized pantry on the right. It is the ideal efficiency kitchen for the loft style living so often associated with Studio apartments. The UKSZ-96 Master Kitchen shown above prior to shipping features a full height Liebherr refrigerator to the left of the center module containing the sink, cooktop, oven and dishwasher. The pantry module on the right side matches the refrigerator module. 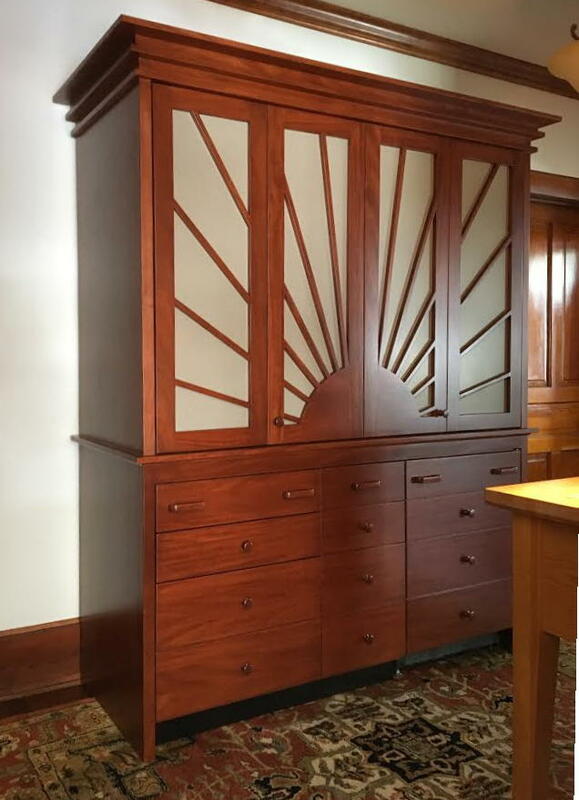 It is shown here without its crown molding. If you don’t need to hide the counter top, cooktop and sink, this hutch style mini-kitchen allows the length of the kitchen to be bigger. 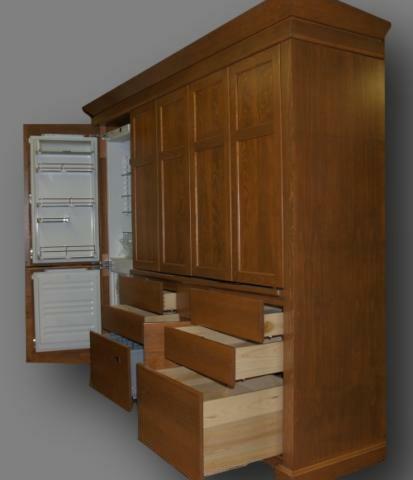 Shown here prior to shipping, this natural maple UK76-MH/UK76-CSR still features a concealed oven, dishwasher and refrigerator, maintaining the look of a real piece of furniture. The back splash is bead board. 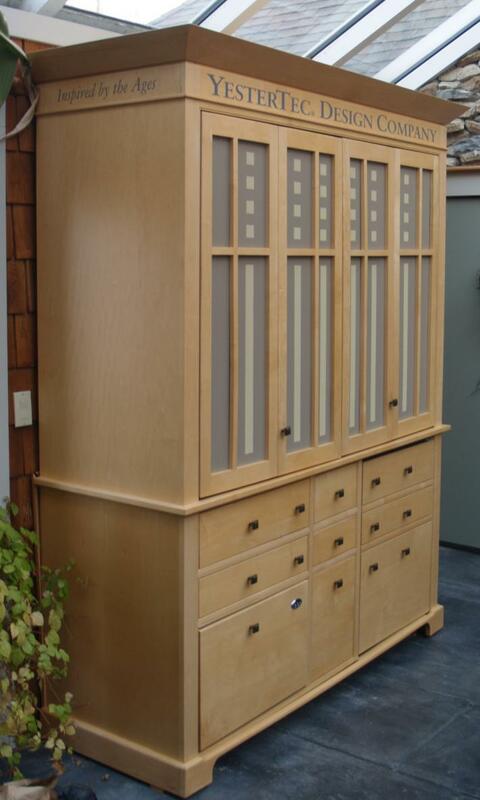 If you don’t need a complete mini-kitchen, we also have a full line of Hospitality Armoires that are very similar in concept to the mini-kitchen armoires except that they are incapable of using built-in cooktops and the powerful ovens featured above. These pieces are designed as convenience centers that can accommodate light duty cooking and snack preparation. This freestanding mini-kitchen is a custom UK72 from our innovative Stealth Kitchen Modules line. 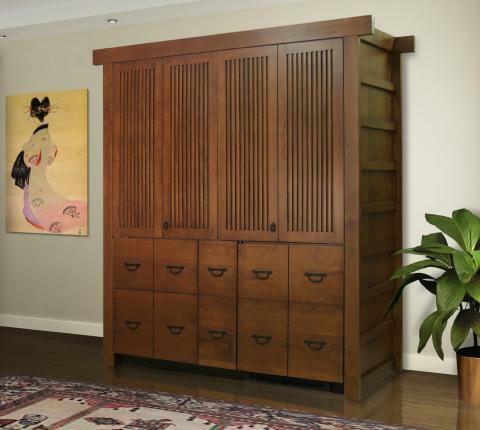 Please click here for more information about this amazing Tansu Styled Mini-Kitchen. Though it is shown here in a Studio apartment setting, its ultimate home is in a home office loft. Above, a built-in ‘Stealth’ UK72 mini-kitchen features minimalist styling achieved by using flush natural maple doors and drawer fronts. Several add-on modules can be added if larger built-in units are required. 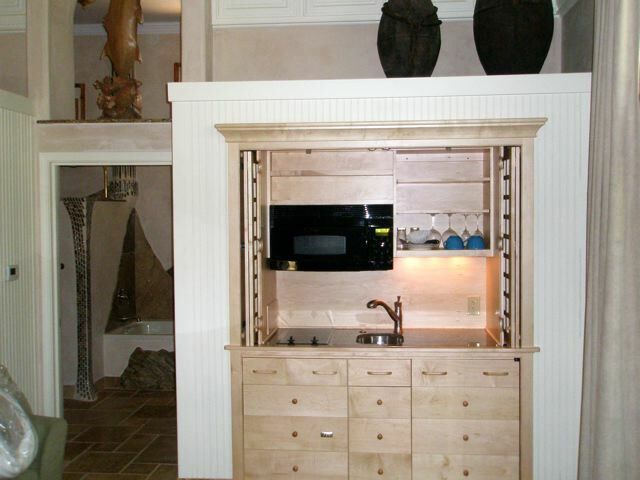 A more elaborate Stealth Mini-kitchen is shown below. 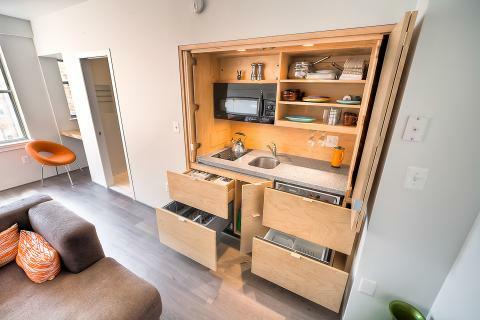 In addition to a 6 foot wide mini kitchen module, it includes a full height refrigerator module, a pantry with a drop down countertop that hides an appliance garage, a pop-up table module and the entire ensemble is topped with extra storage modules. These modular kitchens are designed for urban multi-task living rooms like studio apartments, small condominiums and efficiency apartments that do not want to see a kitchen ALL the time. 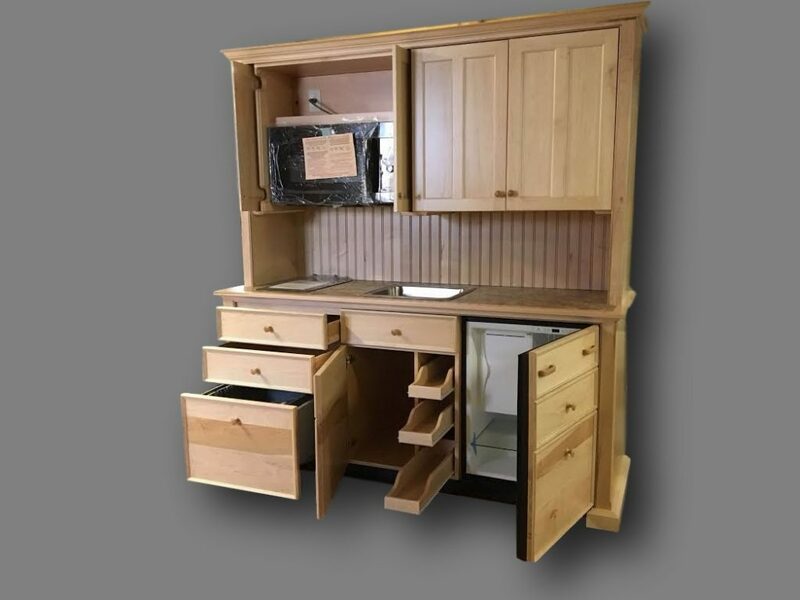 Please contact us for ordering information or to receive a list of our Mini-Kitchen and Hospitality Center models and their starting and average prices. Please sign up for our Newsletter if you want to stay informed about Alternative Kitchen Solutions. The signup up button is just below, just click on Join Now. Previous ArticleEclectic Renovation leads to Better Meals!